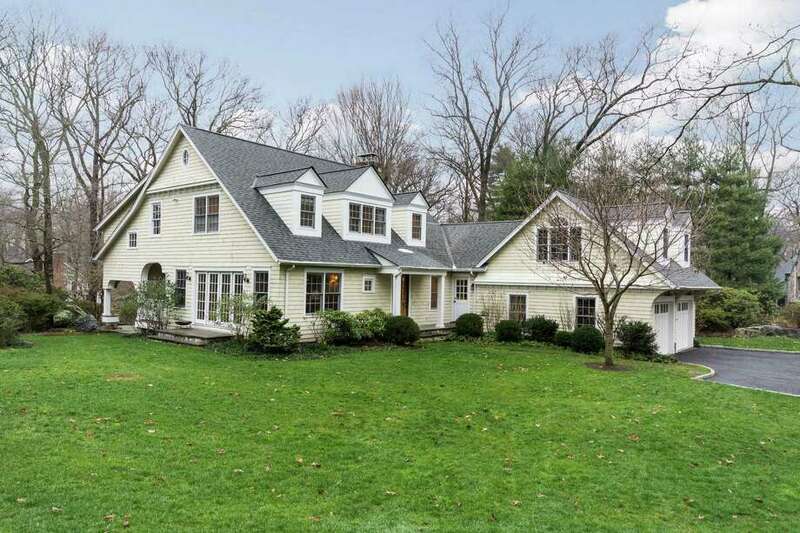 This Tokeneke home in Darien offers 3,470 square feet of living space. Tucked on a sought-after Cedar Gate Association cul-de-sac in Darien, the renovated 1930s Colonial offers a beautifully crafted home in a prime location. The clapboard sided Colonial is on 0.8 acres of property in the heart of Tokeneke. The property is filled with professionally landscaped gardens and stone terraces for outdoor entertaining in warmer months. Inside, the home offers 3,470 square feet of living space completely renovated by current owners with plenty of custom details. An entry foyer opens into a cozy formal living room that is wrapped in grass cloth wallpaper and features a wood-burning stone fireplace and recessed lighting. Steps down from the living room is a carpeted office space with a wall-of built-in bookcases and French doors leading to a stone terrace with a knee wall surround. A bright and cheerful family room offers a comfortable spot for everyday living with a white built-in media center as well as a built-in computer station. The family room also has a set of French doors leading outside. At the heart of the home is a state-of-the-art eat-in chef’s kitchen with granite counters and a farmhouse-style center island with a butcher-block countertop with a hammered nickel hand-washing sink. State-of-the-art appliances include a six-burner Thermador range and oven, a Subzero refrigerator and a Bosch dishwasher. In addition, the kitchen features a Subzero wine refrigerator and stainless front apron farm sink. A sun-filled dining room features three walls lined with windows and French doors leading to a screened-in porch and lower terrace. The first floor also includes two half-bathrooms, a bright laundry room with plenty of cabinetry and counter space and a mudroom with four built-in cubbies and a storage bench for organizing everyday items. A spacious great room over the two-car garage offers a great space for a playroom with built-in alcoves for a window bench and built-in storage. The second floor of the home includes four family bedrooms, each with its own full bath. A large master suite features recessed lighting, a walk-in closet with organizational storage and an en suite master bath with a beautiful claw foot tub, a frameless glass step-in shower and substantial white marble vanity.